If neither the awesome might of the robotic 12-person beer bong nor the motivational power of free rectal exams are enough to help the Brewers catch the Cubs in the NL Central, then perhaps Prince Fielder's red-hot animosity toward his father is. 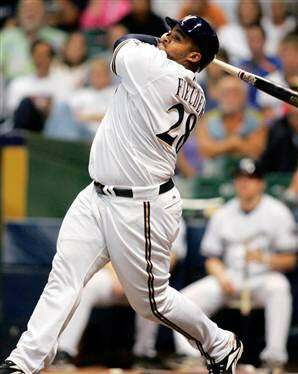 Fielder The Younger hit home runs No. 49 and 50 on Tuesday, propelling Milwaukee past St. Louis, 9-1, pulling the Brewers within two games of first-place Chicago. Fielder became the youngest player ever to hit 50 in a season, and afterwards had a few choice phrases for his dad, Cecil. "That's why I'm so passionate about playing. I don't mind them comparing me, but I'm totally a different player," said Prince Fielder, who hopes to hit 52 homers this season to beat his father's best mark of 51 (1990), and "shut him up." Wow. "Hopefully one day, whenever they mention my name, they won't have to mention his," said Prince, who had a two-run homer in the first and a two-run homer in the seventh, surpassing Willie Mays as the youngest to hit 50. Mays was 24 years, 137 days old when he hit his 50th home run in 1955, according to the Elias Sports Bureau. Fielder is 23 years, 139 days old. Anyway, the Cubs lost to the Marlins and Dontrelle Willis on Tuesday, 4-2. But there's no curse. Nope. • The Life Of Brian. Brian Giles, 1-for-his-past-52, had a three-run homer with two out in the ninth to give San Diego a 6-4 win at San Francisco. That dramatic enough for ya, Padres' fans? Your team is one game ahead of Colorado and Philadelphia in the NL wild card, and two back of Arizona in the West. For their next trick, San Diego will trot out Jake Peavy today to face the Giants in Barry Bonds' home finale. • Your Dioner Navarro Update. The Devil Rays saw Alex Rodriguez's grand slam and raised a grand slam by Jorge Velandia, with Dioner Navarro then hitting a solo homer in the 10th to lift Tampa Bay over the Yankees 7-6. It all prevented New York from clinching a playoff berth. The Yankees lead Detroit by 4½ games in the wild-card race, with five to play. Did you know that the Yankees have the majors' best record (47-24) since the All-Star break? But if they just could have handled the worst team in the AL (they were 8-8 against the Devil Rays), the Yankees could have won the division. • Why, Why, Why, Mets? Instead of recounting the obvious, please just look at this. Thanks, and see you tomorrow. • Colorado 9, Los Angeles 7. Anyone notice that the Rockies have won nine straight? Anyone?